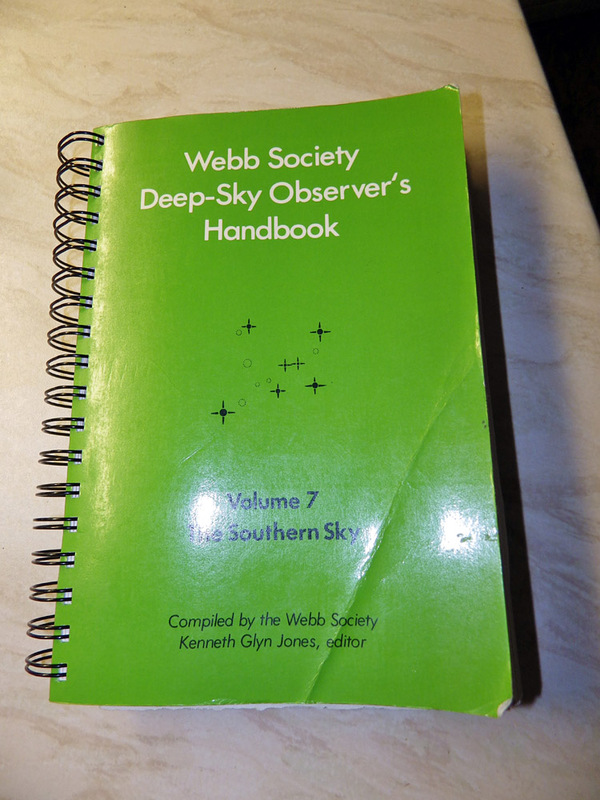 One of my favourite observing books is the Webb Society Deep-Sky Observer’s Handbook Volume 7: The Southern Sky, but my battered copy, which has had several trips abroad, including my first, big, trip to Australia in 1997, was falling apart. These books are glue-bound which is frankly hopeless and generally leads to books coming apart at the spine especially when, like me, you are prone to shoving printed observing lists inside the book. I will take this book back to Australia with me next March so, as I didn’t want to lose any of the pages and these books are out of print now*, I cut the spine off and took the rest into Staples who rebound it with a much more robust wire binding. Below is the repaired book, closed and open. 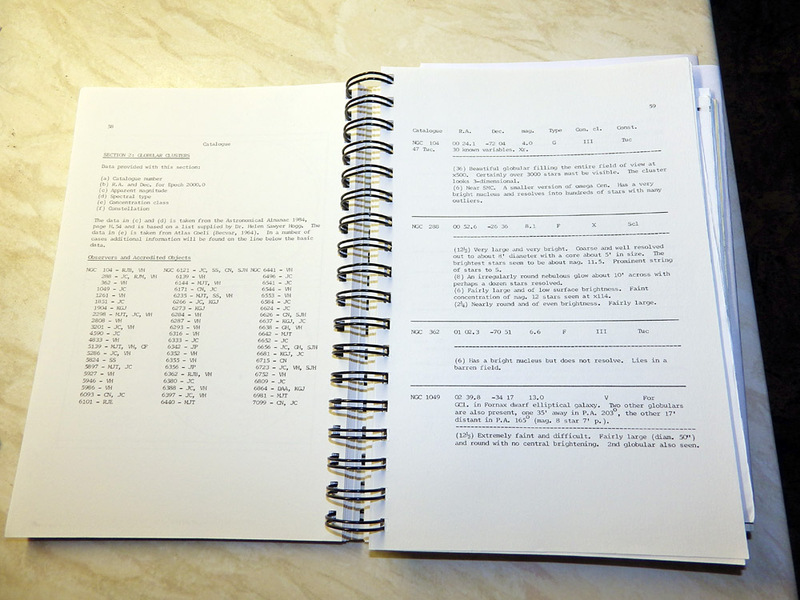 The apparently loose pages you can see are printed observing lists and other information shoved inside the book. *I had an email from the Webb Deep-Sky Society’s Owen Brazell, they have a few left at £2 each. If you want a copy, you can get them through the Webb Society’s home page. All the other handbooks, Vols 1-6 and 8 are now unavailable. This entry was posted in Australia, Books on June 25, 2013 by FJA. When I first got into serious deep sky observing, around 1992, the seminal Deep Sky Magazine had already been consigned to the annals of astronomy history. This excellent little magazine was started by David Eicher in the late 1970’s/early 1980’s and went on to be published by the same people responsible for Astronomy Magazine before being axed by the publishers in 1992. How I heard about DS Magazine was through its mention in the Webb Society Deep Sky Observer and also through reading a few copies at someone’s house during a visit to Australia in 1997, from then I wanted to get my hands on some copies of DSM. I tried to track down copies of DSM via the net without much success, but got lucky when Dave Eicher himself had a load for sale. I have since completed my collection with a few more copies that I came by via the net and just recently, downloadable pdf copies available on Kalmbach Publishing’s web site. The scans aren’t great, but they only cost $3.95 a copy and are well worth getting hold of. This was a great little publication and I don’t believe it was adequately replaced, although the Webb Deep Sky Society’s Deep Sky Observer and the excellent Amateur Astronomy Magazine come fairly close between them, although I don’t think either are quite as good – AA is my favourite mag, but falls short a bit on deep sky observing articles although it’s excellent for star party articles and the amateur scene and DSO is not quite as good as DSM was. Some DSM articles were published in David Eicher’s Galaxies and the Universe, although for the whole DSM experience, getting hold of the magazine itself is well worth the cost. This entry was posted in Books on September 18, 2009 by FJA. I ordered a copy of Steve O’Meara’s book ‘Deep-Sky Companions: Hidden Treasures‘ from Waterstones last Saturday and it arrived today, so I went into town and collected it after work. It is a big, fat book, much larger than Steve’s previous books in the Deep-Sky Companions series: ‘The Messier Objects‘ and ‘The Caldwell Objects‘ (to be honest, I have no time for the ‘Caldwell Catalogue’ but I collect books on deep sky observing and it was nice to have this as part of the set. Besides, I bought it at London Astrofest in 2006 when Steve was there, doing a talk and I got mine signed – how could I resist?!) but is laid out the same way, object by object, with information, photos, sketches and descriptions. Because of the title Hidden Treasures, Steve has introduced a pirate theme and categorised observers as such e.g. people who observe objects quickly and move on for the sake of completing lists (such as Herschel 400, etc) are described as hit-and-run ‘Barbary pirates’ while those who take their time and really look at objects, maybe making notes and sketches are the more ‘romantic’ pirates, such as the Pirates of the Caribbean, rifling through the treasure chests of the night sky, although I think there’s a bit of both observer-pirate types in all of us. I have seen people on various forums on the net saying they dislike the pirate theme, but personally I find it a refreshing change, it isn’t laboured and it is a bit of fun, although on my first flick through I did wonder at first about the fixation with ships before the pirate connotations became apparent. It’s not all pirate fun though, the object descriptions are serious enough, and it is full of excellent tips on how to observe these objects. Steve is a wonderful observer (I had the pleasure of observing with him at the Texas Star Party in 2006) and as ever, his super sketches grace the book. As a visual observer myself, I particularly appreciate books with a visual bias and this is one of the best. Steve does have the advantage of a high observing site, on Kilauea Volcano in Hawai’i, which is also blessed with good weather and many clear nights but this shouldn’t detract from the usefulness of this book in planning your own observing sessions. I am looking forward to going to bed in a while (yes, it is cloudy!) and having a good read. Eight weeks to go until the Texas Star Party! I am flying to San Antonio on the 31st May (Saturday) and will get to the Prude Ranch on the Monday. I’m hoping it will be clear for some Big Scope observing, like last time, but even if it isn’t (2005 and 2007 were grotty) the party will, for me, be on with or without stars. I’m there for the socialising as much as for the observing, a change of scenery and also indulging in my other hobby of birding. I wish I was at the BAA Winchester Weekend. That’s on this weekend and I’m stuck at work until Monday! Ok, it isn’t what it used to be (what is, these days?) but it’s a fun social event. Mind you, I’m skint, so I couldn’t go even if I wasn’t working. I paid out for my air fare to the States a couple of weeks ago and my car is being MOT’d and serviced next week. This entry was posted in Books on April 4, 2008 by FJA.